There is something magical in the stories of neglected British children. From Frances Hodgson Burnett to Kazuo Ishiguro to Lemony Snicket—those misty childhoods, couched in the white light of northern Europe, the moors of the English countryside out yonder, make a particularly pleasurable fictional setting to revisit as an adult. Warlight cautiously renders the fog that occupies a bombed-out city, the confusion, the loss of identity after experiencing the ineffable. The novel has the convincing feeling of a very conscious (and sometimes pompous) memoir—a sober coming-of-age story. Like in The English Patient and other Ondaatje novels, the story is shrouded in mystery, peppered with many seemingly unnecessary details (like: the machinations of mussel boats on the River Thames, or the play-by-play of greyhound races). But, for the most part, that mystery is accessible; Warlight knows just how much to divulge, when, and where. While I found the early chapters rather slow, wondering from time to time where the novel is going with its meandering plot—about 100 pages in, the pace picked up and turned almost cinematic. I was riveted, as Nathaniel grows up and begins to investigate his mother’s life, and as the novel artfully flashes back to the war years. And it is the moment that we exit Nathaniel’s self-consciousness, and enter the secret experiences of his mother, Rose, that the novel shifts. After all, it is Rose who is at the center of the novel—it is she who makes the book sparkle. The more she appears, with her lithe body and birthmarked neck, the more we see of her missions in Europe and the man (note: not her husband) whom she operates alongside, the more we understand the reason she had to distance herself from her children entirely, and the more the early chapters of Nathaniel’s childhood pale in comparison. Warlight’s prose shines most as it takes us on this cross-continental journey, crossing borders and years, unwrapping the cautious opening it crafted at the start. The concept of a teenager walking while reading, in order to avoid whatever happens around her on the street, all the while being sexually harassed and scrutinized by her traditional community, is a deeply powerful image. Yet the execution of the novel made it an incessant read. Buy this special ToB Memo Book for $5 and Field Notes will donate 100% of the proceeds to 826 National, which provides free educational programs to under-resourced youth. Milkman is macabre and heavy-handed. When it comes to describing violence—either physical or sexual—subtlety is often essential, and when done right, all the more powerful; any avid reader of slavery-era or Holocaust fiction knows that the more details left to the reader’s mind, the better, for what is a darker place than the human imagination? (Warlight, in contrast, does this well, for the most part. Its murder scenes are kept minimal—less is more, in this case.) Here, in Milkman, there is no room for moderation or pace. After all, in the novel’s very opening page alone, the reader is handed a murder attempt, a murder, an adulterous affair, infidelity, and the sexual harassment of a 12-year-old girl. Say that five times fast. 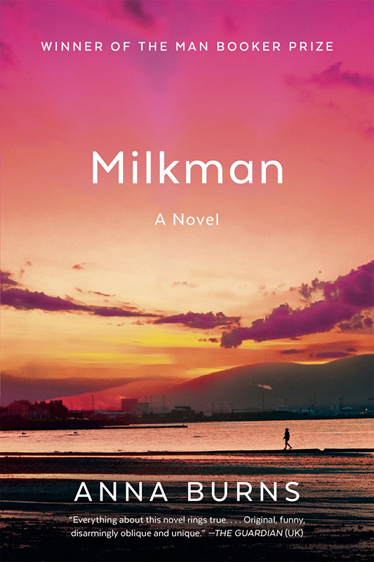 In Milkman, the violence is explicit, but the characters and setting remain shapeless. And while its stream-of-consciousness is, yes, at first interesting, 348 pages of page-long paragraphs with no specific details, and that lack in any sort of poetic rhythm, is going a bit far. I didn’t know shame. I mean as a word, because as a word, I hadn’t yet entered the communal vocabulary. Certainly I knew the feeling of shame and I knew everybody around me knew that feeling as well. In no way was it a weak feeling, for it seemed more potent than anger, more potent than hatred, stronger even than that most disguised of emotions, fear. At that time there was no way to grapple with or transcend it. Another thing was that often it was a public feeling, needing numbers to swell its effectiveness, regardless of whether you were the one doing the shaming, the one witnessing the shaming, or the one having the shame done unto you. Given it was such a complex, involved, very advanced feeling, most people here did all kinds of permutations in order not to have it: killing people, doing verbal damage to people, doing mental damage to people, and not least, also not infrequently, doing those things to oneself. While I appreciate the meditation on the power of shame—particularly when it comes to a young woman in a traditional society—a sharp editor, to my mind, would have polished this to have more punch. This is true of the prose throughout the novel, which I found downright distressing at times, which was a terrible shame—for while the premise at the heart of this story was a powerful one, the choice of language hijacked that point. I can appreciate the mimicking of an obsessive teenager’s mind, and more generally speaking, a fresh experimentation with language. But if this style is the centerpiece of the work, that prose ought to sing, offer music, whether it be classical or heavy metal. Yet the prose falls flat. Milkman seems to be overly occupied with its own style, its difference, and its reliance on a thesaurus—and less with character development and human relationships—to notice that the poetry to justify that stylistic occupation is simply absent. Sometimes, namelessness can greatly expand a narrative, make a foreigner relate to it, encourage a reader to apply his own inheritance of war memories or experiences to color in the lines of an anonymous story. And while depersonalization may have been an integral part of living through Ireland’s Troubles—names being dangerously implicating, exposing one’s affiliations—here, the anonymity was unpersuasive. The protagonist, nameless as she is, remains shielded from the reader; her humanity and her struggles are thus all the harder to access. As today’s public discourse becomes all the more murky, I believe we are compelled to use specific language, particularly when it comes to describing violence and to the policing of women’s bodies. I may be an old-fashioned soul, but experimental form that involves such intense opacity, and lacks lyricism and movement, is unnerving. And perhaps that was Milkman’s point—to afflict the reader! Yet that affliction emerges as a result of its style choice alone, rather than from the novel’s plot, character developments, or themes. The reader is prodded to consider their relationship with the diction, with the run-on sentences, rather than with the actual terrifying story at hand. Please, unnerve me with your message, your protagonists, your narrative—not merely with your sentence structure. Kevin Guilfoile: As we discussed after Milkman’s opening-round victory, some books make the reader work harder and as the reader you either dig that or you don’t. And when you get tired of carrying the heavy end of the literary sofa bed, it’s easy to just chuck the book across the room and reach for the next volume on the TBR pile. I like the way Judge Chizhik-Goldschmidt really interrogates the reasons why she resisted taking on more than her fair share of Milkman’s weight. Which is to say that longtime Roosterheads and fans of the unofficial ToB drinking game will want to line up their shot glasses because I’m about to bring some David Foster Wallace. Infinite Jest opens with a scene that could have been lifted from a Marvel comic. And then it becomes a bit of a slog. The next 250 pages or so are disorienting, and include many long digressions, and are interrupted frequently by non-optional diversions into the end notes. It’s aggressively unpleasant to read at times, almost as if Wallace is daring you to quit (and I suspect most readers do in the first quarter). But once you get through that, it becomes much, much more digestible. And funnier. And more comprehensible. It becomes quite a joy to read, in fact. And at some point you realize that your experience reading the book is something like a simulation of the journey taken by the halfway-house residents in the story, who are told by their 12-step mentors to not quit and to “keep coming back.” When you do, it gets easier. And when you realize how the difficult structure of the novel is integrated so seamlessly into the story itself, it is a glorious revelation and that’s one reason why people who have not read it are so frequently annoyed by people who are endlessly evangelizing for it, just as half the Commentariat is annoyed by me right now. Judge Chizhik-Goldschmidt found the structural obstacles to reading Milkman to be largely stylistic, and so she was fairly unforgiving. There was no glorious revelation for her. John Warner: It’s interesting to think about how different books challenge us in different ways. With Warlight, I found those first 100 pages slower going than Judge Chizhik-Goldschmidt, to the point that when I had to make a choice of what book I was going to take on a short trip, I put it aside for something else, and didn’t feel compelled to get back to Warlight until I saw it advancing in the Tournament. Perhaps Michael Ondaatje isn’t the type of writer that an editor gets to suggest structural upheavals to, but once I picked the book back up and got past his “cautious opening” I saw a book that wasn’t quite a espionage/thriller, but had some definite espionage/thriller elements. I’ll be honest, I wanted to read that book more than the one I’d been given. This is not to say the book I wanted would be better that the book I’d been given, just that the parts of the book that sang to me pushed me in that direction. Warlight was not a “difficult” book in the slightest, and yet, I found it difficult to keep going until I crossed the story threshold Judge Chizhik-Goldschmidt identifies in her verdict. I suppose all books can be difficult in one way or another. Or are there some books that are instantly inviting to all? There’s one for the peanut gallery to chew on in the comments. I don’t have an answer to my own question. Kevin: Occasionally I will critique a manuscript (or a partial one) for a good friend or an attendee of a workshop I am teaching—please, please do not send me your unsolicited manuscripts—and the comment I give most often is one about frontloading the story. You have to make an opening argument in favor of reading your novel. You need to give readers a reason to finish your book, and you need to do it right away. You need to give them questions that have to be answered, and compelling characters with dilemmas that the reader wants to see resolved. No one will read your book just because you wrote it. Of course that’s not really true of Michael Ondaatje. Plenty of people will read Warlight just because he wrote it. So he is free to meander a little in the opening pages. I found it a pleasant meander for sure, but you’re right, he doesn’t really give you a sense of urgency in those early chapters. John: Books that wear their difficulty on their sleeve are a bit different, though, right? The first page of Milkman lets you know that you’re going to have to give yourself over to the prose to reap its rewards. Infinite Jest’s sheer size and all those endnotes announce “difficult,” but of course, that’s one of the reasons people try to take the book on to begin with, to be able to say they did it. One of the reasons I read Infinite Jest when I did was because it was the only book in my possession for a several-week period at the end of grad school when I was selling all my possessions and shipping everything I was keeping back to Chicago. By the end, I had my laptop, a bedroll, a lamp, a dog, and a copy of Infinite Jest. If I was in my apartment I could write, sleep, or read Infinite Jest. At some point, the book became the chief feature of my life. I probably never would’ve read it otherwise. Under those circumstances, my reading of Infinite Jest was indeed revelatory. I don’t think I’ll ever find myself in a position where I could experience something similar again. Kevin: So we check Milkman against the Zombie balloting and we find that it does not have enough votes. If the Zombie Round were held today, our fictive Frankenstein experiments would still be My Sister, the Serial Killer and Washington Black. This means we send Milkman adrift on a Viking funeral boat and nock a flaming arrow in its honor. New 2019 Tournament of Books merch is now available at the TMN Store. As a reminder, Sustaining Members receive 50 percent off everything in our store. To find out why we're asking for your support and how you can become a Sustaining Member, please visit our Membership page. Thank you. To keep our comments section as inclusive as possible for the book-loving public, please follow the guidelines below. We reserve the right to delete inappropriate or abusive comments, such as ad hominem attacks. We ban users who repeatedly post inappropriate comments. Criticize ideas, not people. Divisiveness can be a result of debates over things we truly care about; err on the side of being generous. Let’s talk and debate and gnash our book-chewing teeth with love and respect for the Rooster community, judges, authors, commentators, and commenters alike. If you’re uninterested in a line of discussion from an individual user, you can privately block them within Disqus to hide their comments (though they’ll still see your posts). We all feel passionately about fiction, but “you’re an idiot if you loved/hated this book that I hated/loved” isn't an argument—it’s just rude. Take a breath.